How is Anne Hathaway going to lose 16 lbs in less than three weeks? Anne Hathaway is on a drastic 500-calorie diet in order to lose weight in a short time for her latest role in Les Miserables. Anne Hathaway, 29, has been ordered to lose 16 lbs in less than three weeks to play dying prostitute Fantine in the movie adaptation of Les Miserables. Although currently a healthy size 10, Anne Hathaway will have to lose 16 lbs for her realistic portrayal of a hungry, dying prostitute. Instead of eating the recommended daily allowance of 2,000 calories a day, Anne Hathaway is now down to under 500 to achieve the rapid result. A film source told the Daily Mirror: “Anne is playing a destitute factory worker-come-lady of the night. “Unfortunately, she only has 15 to 20 days to lose as much weight as possible – up to a stone-and-a-half – because she’s been filming the scenes showing her fit and healthy, almost slightly chubby. “It’s not ideal but, as with any high-budget movie, there are strict time constraints. Anne Hathaway is no stranger to having to lose weight for roles. 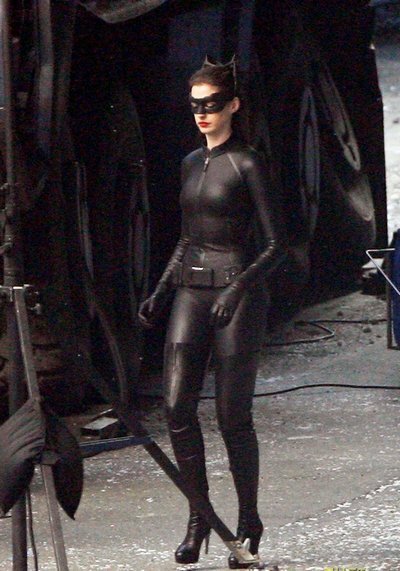 In 2011, the actress slimmed down to fit into an unforgiving catsuit to play Catwoman in The Dark Knight Rises. Anne Hathaway started doing Bikram yoga and push-ups and eating vegetables, fish and fruit to shape down.